With more than 2 million people behind bars, the US has more prisoners than any other nation. Although 4.4% of the world's population lives in the US, nearly a quarter of the world's inmates are in its prisons. According to the World Prison Brief, the proportion of prisoners to the general population is the second highest in the world at 666 per 100,000 inhabitants, beaten only by the tiny island nation of Seychelles. Per a 2017 report from the US Department of Justice, a further 3.8 million people were on probation, and 870,500 former prisoners were on parole as of 2015. People of color are disproportionately affected. A 2016 study by nonprofit advocacy group The Sentencing Project found that African Americans and Latinos are incarcerated in state prisons at 5.1 and 1.4 times the rate of white people respectively and that, in 11 states, at least one in 20 adult black men are in prison. Although African Americans and Hispanics together make up approximately 32% of the US population, they comprised 56% of all incarcerated people in 2015, according to the National Association for the Advancement of Colored People. This crisis is the subject of "Prison Nation," an exhibition at New York's Aperture Foundation and an accompanying edition of Aperture magazine, both looking at photography's role in creating a visual record of this reality. "One of the main reasons for this is the goal of mass incarceration, which is confinement and the inability of incarcerated people to document and record the actual conditions of prisons," contributing editor Nicole R. Fleetwood, an associate professor of American studies at Rutgers University, said in a phone interview. "Even for non-incarcerated photographers who go into prisons to take photos, access really depends on race and gender, with white men having it much easier than women or people of color, so without a doubt what you see is the power of the camera," said Fleetwood, whose research has looked at the relationship between art and incarceration. The special issue of Aperture features the work of a dozen photographers and writers. The title "Prison Nation" is not just a reference to the scale of the problem, but also to the fact that mass incarceration has created a network of public agencies and private companies that profit from the system. Some of the most poignant shots come from Deborah Luster, who photographed inmates from a theater group in the largest maximum security prison in the world, the Louisiana State Penitentiary. The detention center is also known by the name of the plantation that previously occupied its grounds, "Angola," after the home country of many of its enslaved African workers. "These are portraits at the highest level of portrait making," Michael Famighetti, editor of Aperture magazine, said in a phone interview. "I think they're incredibly powerful and really highlight the individuality of the subjects in a strong way. Most of these individuals are sentenced to life in prison and will die at Angola." Among the most peculiar works are Jesse Krimes' hand-printed transfers on prison soap bars. "Krimes was incarcerated for drug crimes," said Fleetwood. "And he did a whole series on prison soap bars where he transferred mugshot and images that he could gather from magazines and other available sources. He's not actually making photographs but he's using photographic imagery to comment on criminalization." The magazine and the exhibition, which features six public programs with a dozen speakers, are meant to act as a springboard for a conversation on the subject. "Even if you don't have any experience of incarceration yourself or you don't have a relative who has been incarcerated, all Americans are ultimately taxpayers implicated in this and photography is an incredibly powerful medium for visualizing this system," said Famighetti. "We just take it for granted that this is the way we deal with issues of crime and punishment and we really have to think critically and creatively around the system because the scale of it alone is out of proportion," said Fleetwood. 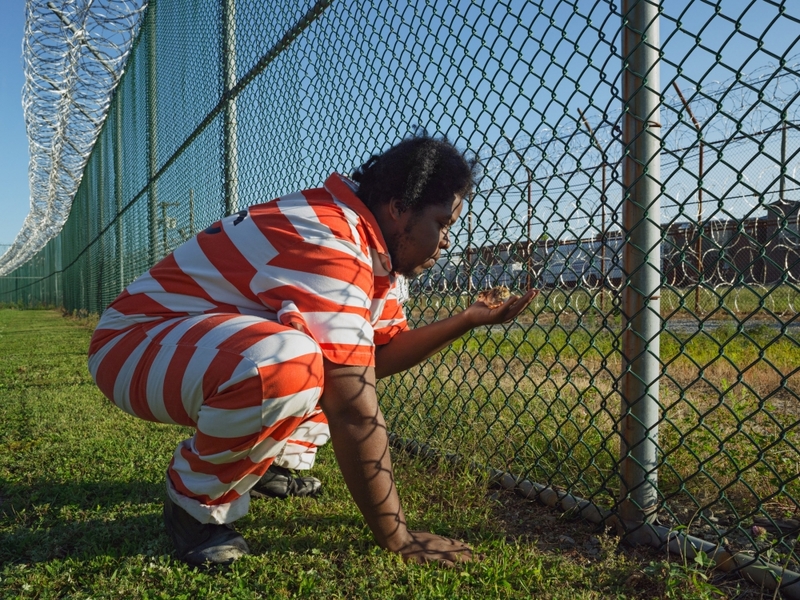 "Prison Nation" is on at New York's Aperture Foundation until Mar. 7, 2018. Aperture magazine's spring issue is out Mar. 6, 2018.